When you want to get away, you don’t want your music cramping your style. You want to put on your destination, find the perfect playlist, and cruise off into the sunset. Luckily, TripAdvisor and Google Play Music are teaming up to do just that. If you’re looking to escape this summer, you need to find the perfect tunes. 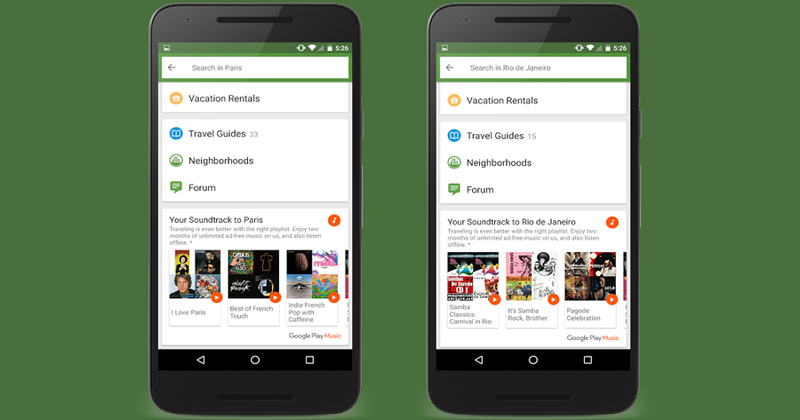 In a recent blog posted by Google Play, Google highlights some features of an awesome new app integrating TripAdvisor and Google Play, so we never run out of our favorite music when we’re on the road. We’ve all been there- you’re getting into driving, you’ve traveled for a few hours, and then your favorite stations disappear. Even worse, you know that you won’t be able to find your favorite songs on the radio when you want to listen to them. More often than not, you’re worried that you won’t be able to find a song or get that great playlist while you’re driving. Besides, you don’t know the best places to get all of your favorite songs and hidden gems in one place. And you also don’t know if you’ll be able to listen anywhere you go. Now, even if you’re in Rio De Janeiro or France you’ll be able to catch your favorite songs in travel planning mode and during your road trips. The best part? You can use this awesome feature anywhere, in more than 60 different countries, all over the world. No matter where you go, as long as Google Play Music is available, you can upload all of your music, and reach it anywhere on your cruise. Next time you start planning, Google recommends starting out with TripAdvisor. They can help you pinpoint your favorite holiday track or cool beat. You can listen to anything from Cafe Italiano in Rome to Underground Club Sounds in Germany. If you’re not subscribed to Google Play, just sign in on the TripAdvisor app, and you can get 2 months for free!